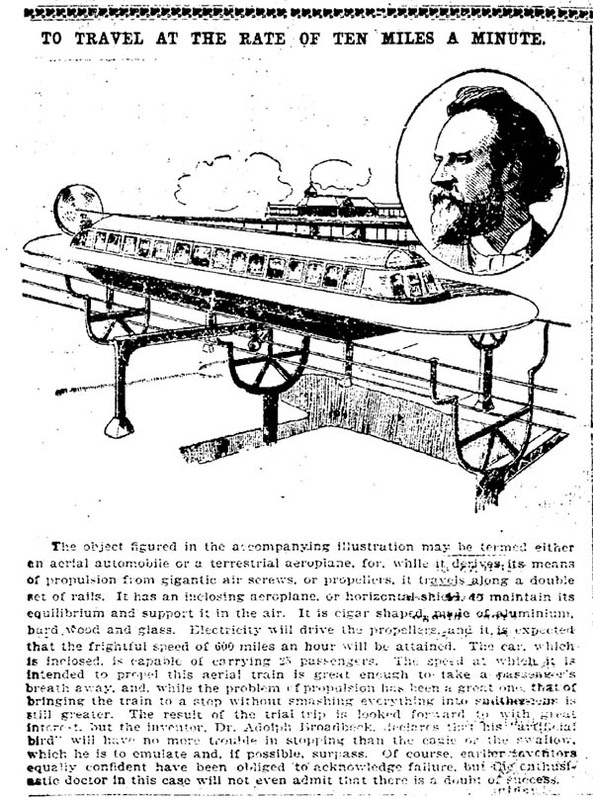 The September 27, 1901 Lincoln Evening News (Lincoln, Nebraska) included a short story and illustration of the elevated train of the future. At a speed of 600 miles an hour, it would have been quite impressive. Below is the entire article. 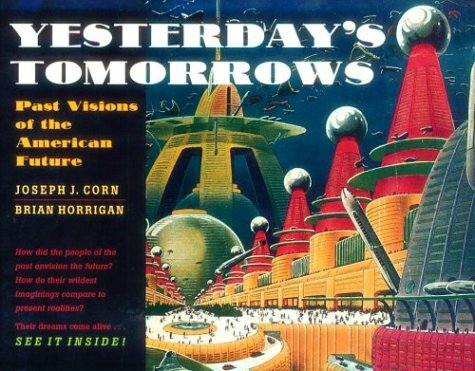 The object figured in the accompanying illustration may be termed either an aerial automobile or a terrestrial aeroplane, for, while it derives its means of propulsion from gigantic air screws, or propellers, it travels along a double set of rails. It has an inclosing aeroplane, or horizontal shield to maintain its equilibrium and support in the air. It is cigar shaped, made of aluminum, hardwood and glass. Electricity will drive the propellers and it is expected that the frightful speed of 600 miles an hour will be attained. The car, which is inclosed, is capable of carrying 23 passengers. The speed at which it is intended to propel this aerial train is great enough to make a passenger's breath away, and, while the problem of propulsion has been a great one that of bringing the train to a stop without smashing everything into smithereens is still greater. The result of the trial trip is looked forward to with great interest but the inventor, Dr. Adolph Broadback, declares that his "artificial bird" will have no more trouble in stopping than the eagle or the swallow, which he is to emulate and, if possible, surpass. Of course, earlier inventors equally confident have been obliged to acknowledge failure, but the enthusiastic doctor in this case will not even admit that there is a doubt of success.